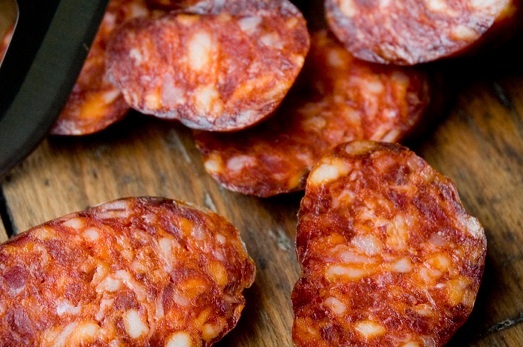 Delicious dried chorizo, ready to eat, made from Australian pork and authentic Spanish spices. Manufactured by hand and allowed to cure in a controlled climate, this premium chorizo perfectly employs old world techniques to deliver authentic Spanish. Available in mild or Chilli. Chorizo Seco is found throughout Spain. Each region has its own variation, adding in hints of flavours, casing and meat grinding sizes. In the north, the Chorizo Pamplonico from Pamplona, has a particular grind and a hint of northern flavour, to La Longaniza Roja in the furthest south of Spain where the influences of the four hundred years of Moorish occupation can still be felt.